We have been doing a little research lately to find out where our baths and basins end up and are rather pleased to discover a number of our products are finding there way into luxury spas and boutique hotels. We know our baths are long lasting and work in both traditional and modern settings but did not realise just how popular they are within commercial settings. 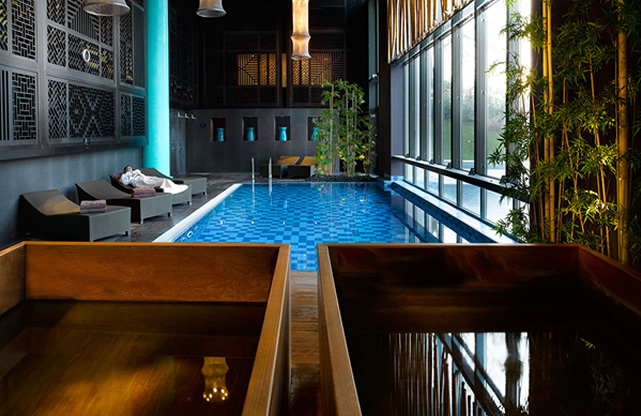 The Buddha-bar Spa @ Hilton Evian-les-Bains features 2 teak Geo baths side by side, one filled with hot and the other with cold water for traditional style ‘alternating bathing’. London’s boutique hotel Malmaison features a William Garvey teak bathroom including a Geo hot tub spa bath located under a waterfall tap, you can even watch TV whilst enjoying a soak. Currently we are making baths for clients in Russia, Switzerland and the USA and we are delighted that our products are equally desirable to both homeowners and the hospitality industry. Images: Buddha-bar Spa @ The Hilton and Malmaison’s bathroom, London.